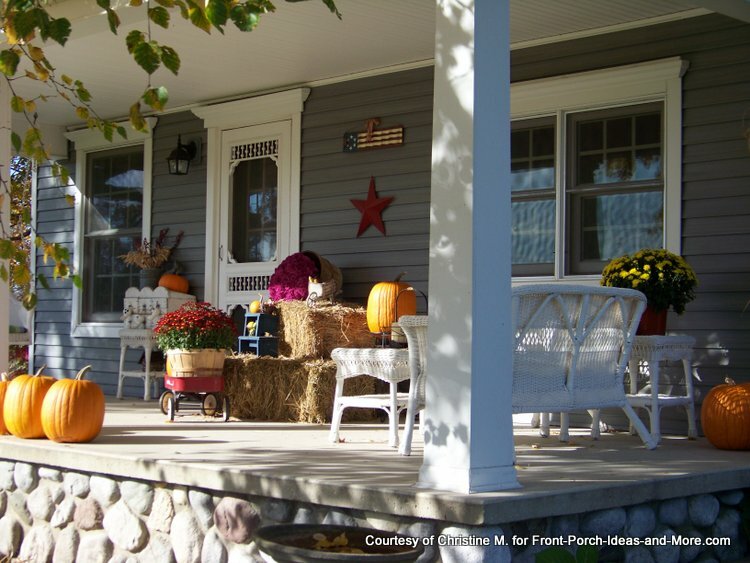 Porches love to be decorated for autumn. 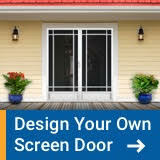 Whether you decorate your entire porch or just a corner, steps, or front door entrance, spending lots of money to do so may not be within your budget. 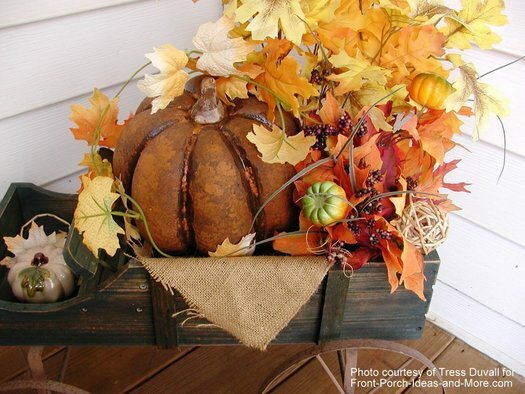 Which of these 12 easy fall decorating ideas would you like to try? Creating an eye-catching autumn display doesn't have to cost an arm and a leg. 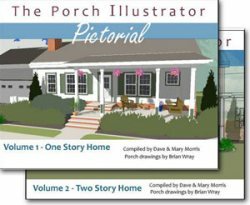 You can easily use items you already have from your home or in your attic, garage, or shed to make an irresistible fall front porch. 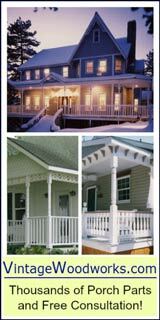 The size of your porch doesn't matter. 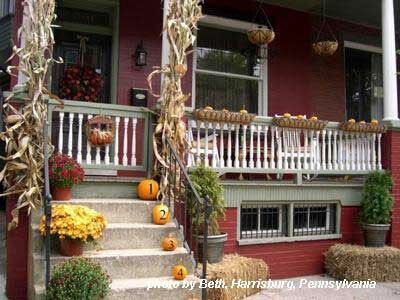 Whether you have a grand wrap-around porch or small stoop, adding fun and colorful fall decorations will make your family, friends and neighbors happy. What better way to celebrate the season than finding just the right decorations. 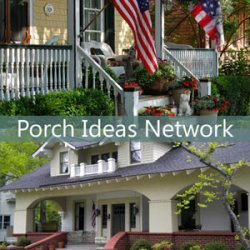 We've compiled 12 easy and inexpensive decorations you can make for your porch or yard. What variations might you have? We hope these get your creative juices flowing. 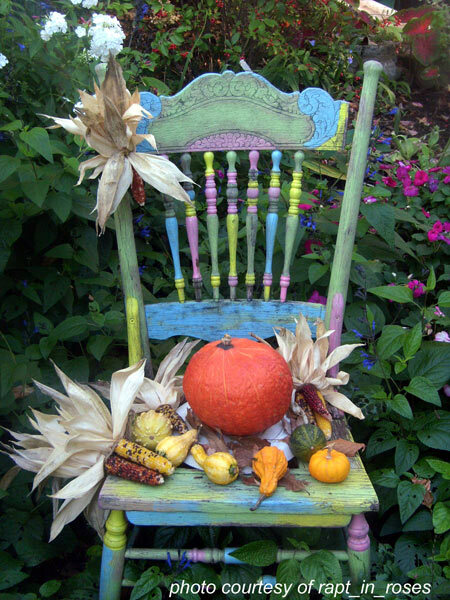 You can easily turn an old chair into a decorative fall piece with paint as shown here. Start by painting a chair in rainbow colors. 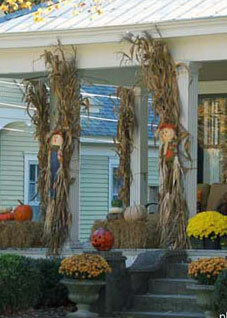 Then add gourds, pumpkins, or corn stalks to give it wonderful autumn appeal. This is my favorite idea (Mary). 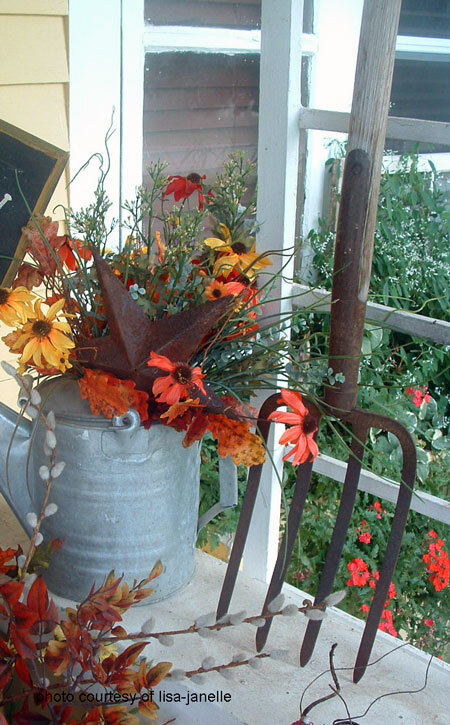 Add yard tools to your autumn displays, whether it be pitchforks, shovels, or rakes. Add old hand tools (or just old wooden tool handles) to a bucket, basket, or box and place among your floral arrangements. Or weave autumn garland through the tines of a yard rake. 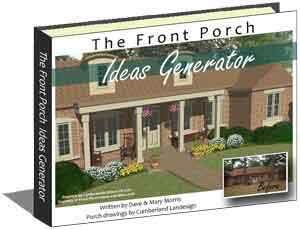 Stand it in a corner of your porch, secure it to a porch column, or stick it in the ground in your porch landscaping. 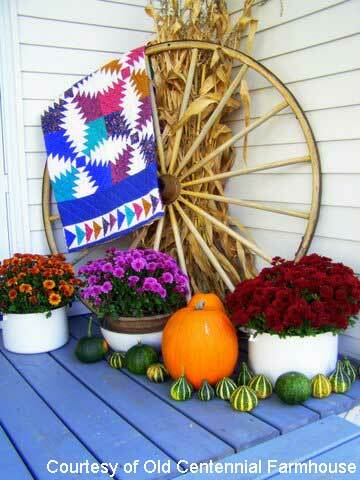 Joni put out her colorful pineapple-patterned quilt with her wagon wheel and gorgeous mums. What kind of arrangement could you make with pumpkins, gourds, mums and a wonderfully colorful quilt? The possibilities are endless. 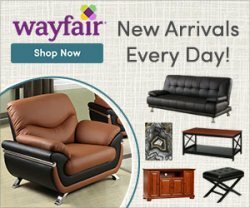 Have an old wagon or cart? That is a perfect starting point for this idea. Fill it with your favorite autumn goodies: fall leaves, dried flowers, autumns, pinecones, gourds or whatever speaks fall to you. Make it as colorful as you can. 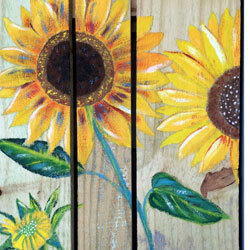 Wouldn't this be just right for a corner of your porch or in your front yard? Use hobby wooden slats to make a picket fence (approx 12- 24 inches high). Mount then on a piece of plywood as a base and cover with autumn leaf garland. 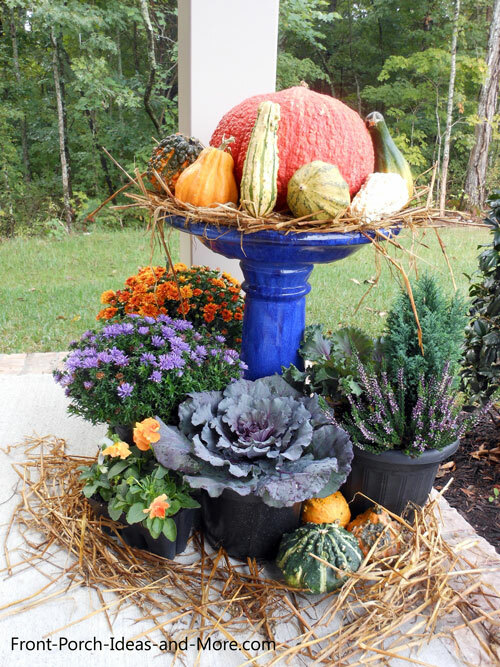 Paint or cover base with pumpkins or gourds. 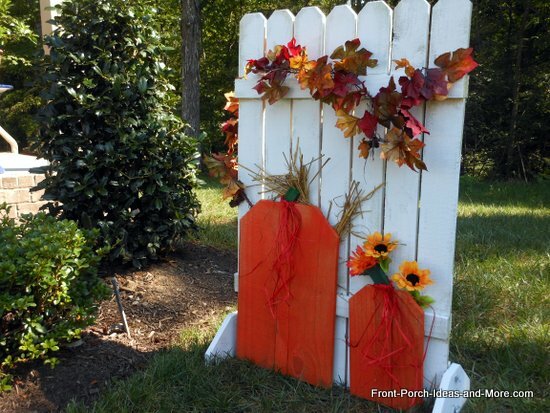 Make this autumn pumpkin fence using inexpensive fence slats. Easy to make (we use only straight cuts) and it can be used for other seasons as well. We show you how to make this fence! Stencil numbers on your pumpkins and line the porch steps with them. 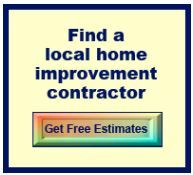 Could be 1-2-3-4 or your house address. A sure conversation-starter and something a little out of the ordinary. Like this idea! 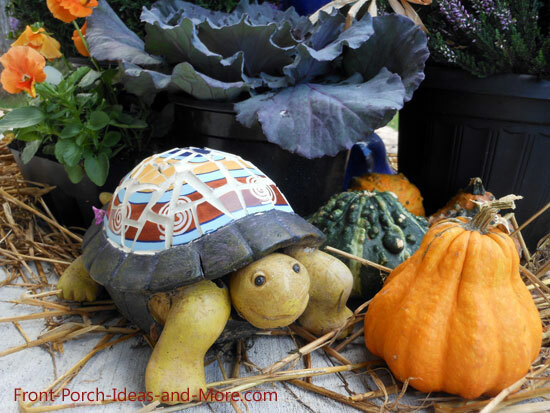 This is really an easy fall decorating idea - add whimsy to your autumn foliage. 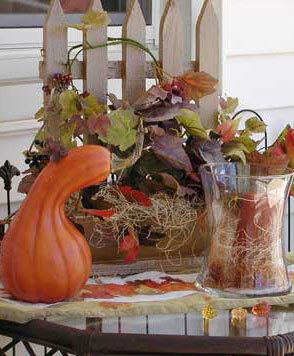 Adding an interesting curio to your autumn displays not only adds a bit of whimsy but also interest as well. We added Fred, our turtle, to our autumn harvest. How about an old toy truck? That would be fun too. For the fall football fans - paint stripes on your pumpkins to match your favorite football teams' colors. Add pennants to the display. The one below is obviously a Cincinnati fan! Tie really tall cornstalks to your porch columns. 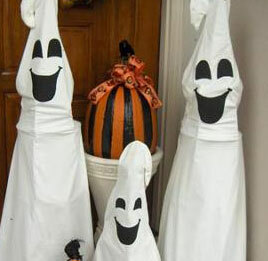 You can add scarecrows (as in the photo below), orange burlap ribbon, or you could also use a little spray paint (perhaps gold) to add color to the cornstalks (don't spray them near your porch though). 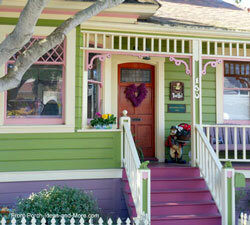 Decorate an old birdbath and place on your porch. You can purchase inexpensive plastic birdbaths and paint them in an autumn color. 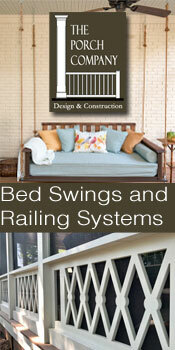 Reuse them in spring and summer for the birds! 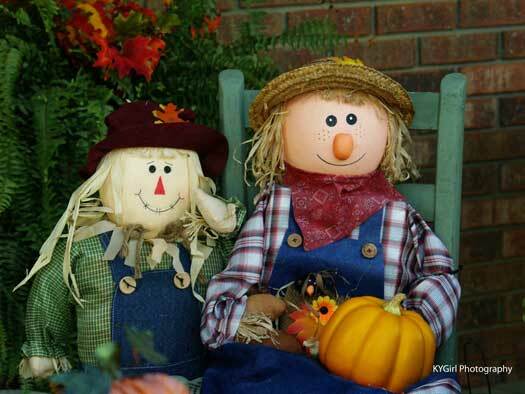 Whether store-bought or you make them, two scarecrows on your front porch can be ridiculously cute - like these. Dave and I learned how to build a scarecrow with our grandchildren. Will you be trying one of our 12 easy fall decorating ideas? 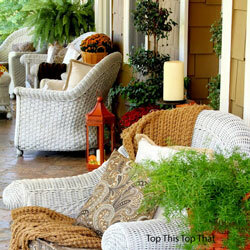 Give your porch some love this autumn!